I may not always understand what Ngmoco is doing, but the iPhone game maker does it well. It’s Full of Stars: Retrieve a piece of cargo known as “the pod” in Ngmoco’s Dropship, but look out for tanks, turrets, interceptor ships, and homing missiles. Dropship, another iPhone/iPod touch offering from Ngmoco, is a retro-style space shooter title in which players must navigate a dropship through increasingly intricate levels in order to retrieve a piece of cargo identified as “the pod.” Throughout each of the game’s 18 levels, players must fight or evade tanks, turrets, interceptor ships, and homing missiles as they rescue downed crew members. Succeed, and you can upgrade your weapons to stand a fighting chance against everything opposing them. While space shooter titles are nothing new to any gaming platform, Dropship’s limitations make the game interesting. 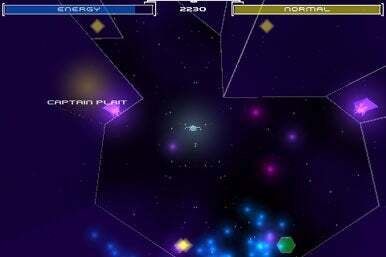 Where a conventional game might offer the player an infinite amount of ammo and fuel to work with, Ngmoco decided to limit the ammo and fuel while instituting a time limit for each level. For each level, you must get in, figure out where the pod is, retrieve it as quickly as possible and fight your way out before jumping to the next level—all of this taking place within about 45 seconds. Even if Dropship’s graphics and sound take on a “retro” theme, they’re executed amazingly well. Terrific space/sci-fi graphics bring back an arcade style feel while great sound work fleshes out the feel of the game and rounds out the increasingly frenetic pace that advances with each level. Strategic elements make the game interesting, and you have to learn to budget your time, deciding what the goals of each level are within a fraction of a second. While an advanced level’s design may require more time to navigate to retrieve the pod, players can instead focusing on rescuing crew members to score weapons upgrades that help to clear out an easier route to the pod. Other factors such as the ship being unable to hold onto the pod while picking up a crew member make strategic decisions that much more crucial to Dropship. Game controls hold Dropship back and make it a bit too challenging for the casual player. Once the game begins, you use your left thumb to control the ship’s movements while swiveling your right thumb around to fire the ship’s cannon. This takes some getting used to, and an included tutorial might have helped lessen the learning curve. Even with this limitation, Ngmoco has done its homework and it shows. A nice auto-save feature allows you to pick up exactly where you left off and a cool Free Play mode lets you simply fool around or practice with the controls. As of this writing, Dropship sells for $1, down from its regular $2 price. In spite of its learning curve, Ngmoco has come up with something surprisingly fun in Dropship. Dropship is compatible with any iPhone or iPod touch running the iPhone 2.1 software update.